The Bhima Koregaon link is helping the police in three ways – it is delegitimising a people’s movement by accusing it of having Maoist links, covering up for the real perpetrators while targeting those who are fighting for the marginalised in the country. Mumbai: On January 12, 2018, nearly two weeks after the Bhima Koregaon Elgar Parishad programme in Pune, the Anti-Terrorist Squad (ATS) of the Maharashtra police knocked on the doors of four workers of Reliance Industries, a contractor in the same company and another casual worker from Thane. A workers’ union activist was arrested a day before. Their houses in the slums were raided for hours and all six of them were taken away to the police station. The ATS arrested another Reliance worker on January 25. All the eight arrested are migrants from the Andhra Pradesh/Telangana regions. They have been charged under the Unlawful Activities (Prevention) Act (UAPA). Their families are still in shock, unable to comprehend what and why this has happened to them. 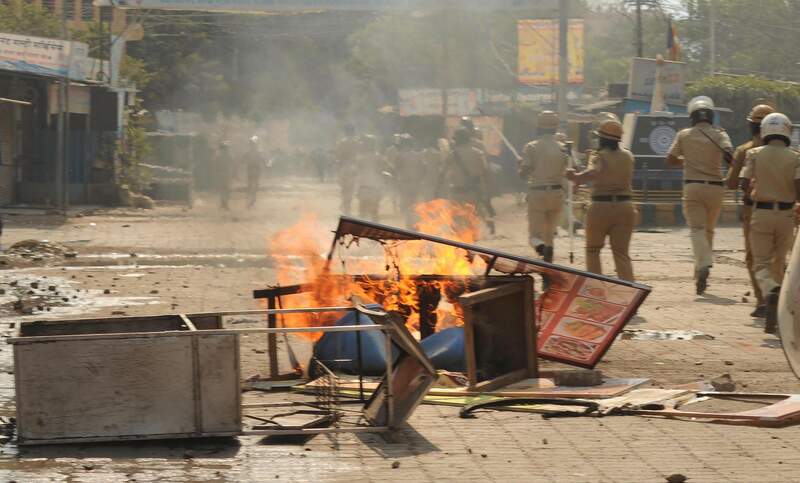 This was one of the first attempts of the Maharashtra police to link ‘Maoists’ to the violence which erupted at the Elgar Parishad programme, organised to commemorate 200 years of the Bhima Koregaon battle. These arrests, however, hardly attracted any media attention, unlike the later arrests in June and August of activists, professors and lawyers. Nine months on, the case against the Reliance workers remains in limbo. Though the workers were charged under UAPA in connection to the Bhima Koregaon violence, as the case unfolded it became clear that the arrests had no connection to the Bhima Koregaon programme except for using the claim to gain media attention, just like in the case of recent arrests of activists. The workers have been charged with various sections of UAPA and not under Maharashtra Control of Organised Crime Act (MCOCA) and yet the case is registered as a MCOCA case. Five of the workers of Reliance Energy/Infrastructure Ltd. – Satyanarayan Rajayya Karrela, Babu Shankar Buchayya Vanguri, Shankarayya Lingayya Gunde, Ravi Rajanna Maarampalli and Saidul Narsimha Singapanga – have been working with the company for nearly two decades. In addition, they are the founders and committee members of the Mumbai Electric Employees Union. For years, this union has been in the forefront of the struggle of workers seeking higher wages and better working conditions. This reporter met with the families of the five Reliance workers in the city. “There were about 15-20 of them in civil dress. I tried to stop them. But the woman among them pushed me and came inside. They pulled out everything in the house and made a mess. It was only at the end they told us that they are the police,” said the wife of one of the arrested. The ATS did not show them any raid notice or arrest warrant. The families were informed that the men would be released by morning. An FIR (CR No. 02 of 2018 at ATS Police Station, Kalachowki, Mumbai) was registered later in the morning of January 13, 2018. In all, 11 charges including forgery and UAPA were levelled against them. Currently, the accused are in Arthur Road Jail, Mumbai. Although, they have stated in court that they had not been tortured, they confided to their families and lawyers in private that they were beaten up in custody. One of the women who went to the police station the following day to collect her mobile phone, which was taken away during the raid, claims that she heard the screams of her husband. She says she saw him getting beaten as she ran upstairs. She was rebuked and shooed away by the police. All of the arrested workers are native Telugu speakers who came to Mumbai. One family had to go back to their village in Andhra since the landlord evicted them following the frequent visits of the ATS squad. The five families are in extreme poverty. Only one woman among them is employed as a domestic worker. The others are making ends meet with the help of their relatives. “We cook one vegetable and the family eats it for two to three days. We don’t know how long we are going to live like this,” said one teary-eyed woman. Shocked by the arrest of her son, the mother of one of the workers passed away two days after he was taken into custody. The workers’ school-going children have had to drop out as their tuition fee have been pending for months now. “The police told the court that they are Maoists and living with false identities. But we shown proof that they are regular employees of Reliance Energy and that they are members of a registered trade union, having permanent addresses and being in service for 5-15 years,” said Susan Abraham, one of the lawyers representing the case. Following the arrests, on January 15, the Mumbai Electric Employees Union leaders met the secretary of the Maharashtra home department to express their concern. They also met the ATS officers on January 17. The union leaders then wrote to chief minister Devendra Fadnavis on January 30. There has been no positive response from the government yet. The police have told the media that they found Maoist literature from the workers homes. This, the union leaders clarified in their letter to the CM, was some unconnected Left literature and trade union linked papers. Their families added that the police also carried away copies of a Telugu workers magazine, Veekshanam. After the first arrests, for many days a number of other workers were also interrogated. They were harassed by being made to wait for hours in the police station. There was an environment of tension and fear among all the workers, still coping with the fact that five of their own had been arrested. Another person named Prabhakar Machha, a school teacher by profession and a close associate and sympathiser of the workers’ union, was also picked up on the night of January 12, but was released later. He is respected in his area and used to translate English literature into Telugu for workers. The police continued to visit his house and interrogate him for hours, until he committed suicide on January 23, 2018. Interestingly, it is only in front of the media that the police has claimed that the men have been arrested in relation to Bhima Koregaon. They are not making the same claim in court. The word Bhima Koregaon is mentioned only to state that the event’s posters were found from the workers’ homes. But that is only one among the hundred other allegations in the chargesheet which accuses the workers of Maoist activities. The tactic is similar in the case of the arrested activists and lawyers too. It is important to note that Arun Ferreira, one of the lawyers representing the Reliance workers in court, was himself arrested in August. The Bhima Koregaon link is helping the police in three ways. One is to delegitimise a people’s movement by accusing it of having Maoist links, second, to cover up for the real perpetrators, Milind Ekbote and Sambhaji Bhide, and third, to target those who are fighting for the marginalised in the country. The workers arrested have all been politically active outside the union as well. They have fought for the rights of all workers to demand necessary safety equipment while working, gloves, uniforms etc. They have participated in the larger struggles and have been organising programmes on different issues like in solidarity with Maruti workers, against atrocities on Dalits and Adivasis, on the occasions of International Working Women’s Day, May Day and so on. Bhima Koregaon posters could be found from anyone who is inclined to the Dalit movement in Maharashtra. Lakhs of Dalit Bahujans visit Bhima Koregaon every year, and since this was the 200th anniversary, multiple organisers had planned extended celebrations. Some of these workers have also visited Bhima Koregaon on December 31, a day before the violence happened. In December 2017, a worker was seriously injured during work. There was a delay in availing medical treatment because company had not provided the required documents. This worker meanwhile passed away. Immediately, workers of the company, including members of this union, stopped work condemning the company’s apathy which has put all the workers in such risk in case they require immediate medical attention. Workers demanded the immediate release of required documents for all the workers. A day after management said it would comply, the company suspended a few workers. One of those suspended has also now been arrested in this case. Nine months down the line, the wives of these workers remain clueless about their fate. They hope that their husbands might come home soon. The police have submitted a 5,000-page chargesheet against the arrested workers. Being implicated in a UAPA case, it’s not even easy to get the workers out on bail. “The stage is for framing of charges before trial. Bail applications were filed in the sessions court which were rejected. So now bail petitions are pending in the high court,” added Susan.